Bingo is no longer for the blue-haired grandmothers – with Players Bingo it is now for everyone! Mecca Bingo, the brand most-beloved by many people with dabbers in hand, have introduced a fun, crazy and brilliant night of food, drinks and entertainment, and with a chance to win money AND prizes! How could you resist! Taking place at Mecca’s Camdentown branch every Thursday and Saturday, Players Bingo is a night of bingo that guarantees fun, laughter, suspense, lots of alcohol (if you so wish), live music, and the perfect food to make it a perfect evening for you and your friends. For just £12, you get a chance to win at 9 games. If you know your bingo at all (c’mon, you know you do), each game consists of getting five numbers in one line, then two full lines, and then a full house – all three lines on a bingo card – and depending on which one you get, and yell ‘Bingo’, you get your money prize (£20, £30, and £50 respectively) – plus a prize if you win on a full house! On the night we were there, the prizes were just incredible – a drone, a mini-refrigerator, and the grand prize was a kayak! I was happy for the chap who won the grand prize but can you imagine taking a kayak home on the tube? There is also food – what would a night of bingo be without some fried greasy bites? Street food brand Cheeky Burger was the food provider the night me and my friend went – and their perfect combination of stuffed mini-burgers, nachos with cheese and guacamole, delicious calamari, and other assorted items went down well in in between the dabbing. And the drinks were bingo-themed – and one of them had a bingo ball in it! 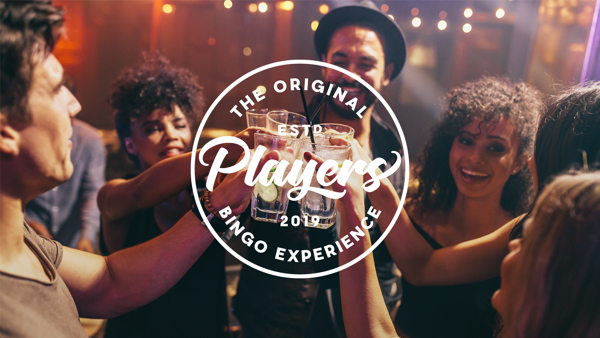 Players Bingo is the most fun you can have with your clothes on, and with the chance to win money and prizes, how could you go wrong? I am definitely going back – hopefully I will win something next time!